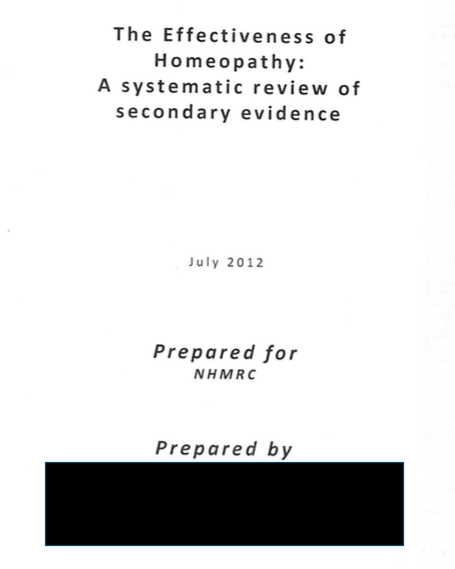 ​NHMRC did not disclose that between April and August 2012 it completed a First Review of the evidence on homeopathy. That is, it withheld from public knowledge that it reviewed the evidence twice. The First Review was titled ‘A Systematic Review of the Evidence on the Effectiveness of Homeopathy’ and was conducted by a highly respected and experienced reviewer, a principal author of NHMRC's own guidelines on how to review health evidence (that NHMRC referenced against the Review) . The first reviewer’s contract commenced on 4 April 2012, coinciding with the commencement of the term of the Homeopathy Working Committee (HWC). NHMRC has refused to release the findings or methodology of the First Review, despite it being a tax-payer funded report. Freedom of Information (FOI) documents reveal that the reviewer delivered on their contract to assess the research evidence on homeopathy, and submitted their final Draft Report to NHMRC at the start of August 2012 . The Office of NHMRC sacked the contractor within days of receiving their final Draft Report, apparently without consulting the Homeopathy Working Committee (the expert committee NHMRC appointed to oversee the Review) . At this time, the NHMRC website announced that the term of the HWC had been extended for another two years, without providing any explanation why. ​An indication of the approach taken by the first reviewer has been revealed in a document released under FOI, revealing the table of contents of the penultimate version of the reviewer's final Draft Report [2A]. Good quality research evidence on homeopathy is known to exist in several medical conditions (e.g. upper respiratory tract infections, sinusitis, cough, hay fever, children with diarrhoea, lower back pain) and it appears highly likely that the First Review reported this evidence. “The summary of the methods is good, given that a fixed format has been used for all of the analyses, which is a positive feature of the overall report." “The template reporting structure makes for dense reading but conversely it is very concise and contains a lot of information." 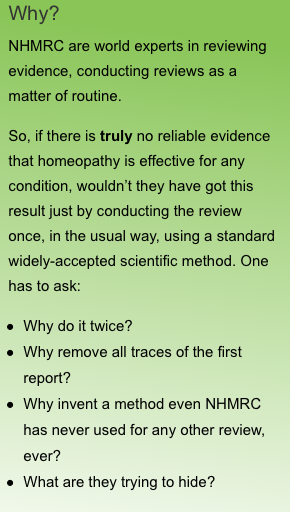 This is perhaps not surprising, since the first reviewer co-authored NHMRC's seminal, accepted method for assessing health evidence, which they had used in reviewing evidence on numerous occasions before undertaking the Homeopathy Review. ​Such feedback is not consistent with a review so deeply flawed it warranted terminating so shortly thereafter. The initial Chair of the HWC (Prof Peter Brooks) was a Supporter of the anti-homeopathy advocacy group Friends of Science in Medicine (FSM), whose conflict was not acted on by NHMRC until half way through the first reviewer’s term . This was not disclosed by NHMRC for the duration of the Review. NHMRC also failed to disclose that Prof Brooks did not declare his conflict upon initially being appointed to the HWC  and he did not acknowledge the conflict when stepping down as Chair . He was retained on the HWC without a formal management plan being instigated for the duration of the Review . See the 'Conflicts of interest' section for further details. NHMRC did not disclose the existence of this review, its findings, methodology, why it was terminated or public expenditure on the process. The first review’s existence is not mentioned anywhere in the NHMRC Administrative Report, NHMRC Annual Reports, NHMRC website or any other publically available NHMRC documentation. The first reviewer was one of the ‘Australian experts in research methods’ that co-developed this 'rigorous approach', having authored a number of seminal NHMRC guidelines. These include those commissioned by NHMRC to guide authors when developing clinical evidence based guidelines, using a standardised methodology that has since become NHMRC’s accepted protocol for reviewing evidence and developing guidelines to ensure quality standards are maintained (the NHMRC ‘dimensions of evidence’ assessment framework). 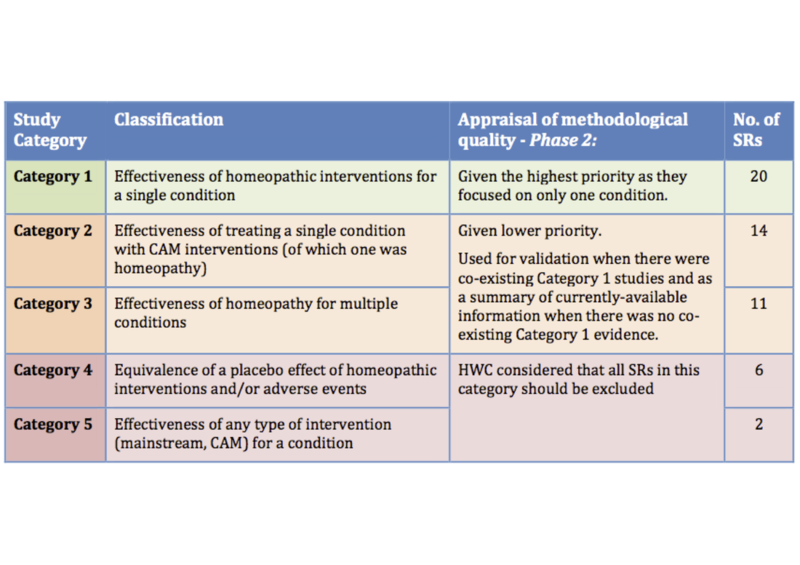 It includes guidelines that NHMRC directly referenced against the Homeopathy Review . They had co-authored numerous publications or were an NHMRC advisor covering specific conditions applying the NHMRC guidelines they had written. It is highly unusual to abruptly terminate the contract of such a highly respected and credentialed reviewer under such circumstances - particularly when the contractor had delivered on their contract and submitted a completed report for consideration. “… the draft information paper that [a senior ONHMRC officer] has worked on … We would be aiming to have a draft information paper completed by the next teleconference”. It is unclear on what basis ONHMRC would complete an Information Paper based on an evidence review that had been terminated. This process was then apparently abandoned in favour of starting again under a new contractor (OptumInsight). In response to a FOI request for the above-mentioned draft information paper, NHMRC responded that it "did not exist". The first review results were kept from the general public, the research was not available for critical review, the potential for innovation and progress that could benefit Australians’ access to potentially promising treatments was denied and valuable public resources were wasted. NHMRC Additional levels of evidence and grades for recommendations for developers of guidelines 2009: NHMRC. Page 9. "I believe that the assessment of secondary literature has been performed very well with careful systematic analysis and the results are supported factually with strong supporting material."